It is the crossover we’ve all been waiting for. 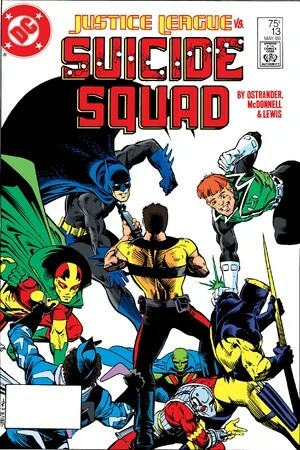 Justice League International comes face to face with the Suicide Squad. Part one hit the stands on January 12, 1988. This had been building in the DC Universe, with Batman uncovering clues to the Suicide Squads existence for months. Once he discovered what they truly were (supervillains used by the government for covert ops in exchange for reduced sentences), he vowed to Amanda Waller to bring them down. Tom Tresser, a.k.a. Nemesis, has been captured in the Soviet Union and has been held prisoner there. He’s been accused of attempting to kidnap a Russian dissident named Zoya Trigorin. The news has gone public, and Batman follows the story while on monitor duty at the New York JLI embassy. Batman knows Nemesis, and thinks he’s a “good man.” While on monitor duty, the dark knight was talking to himself, explaining to Oberon that it helps his thinking process. Oberon warns Black Canary to stay clear of Batman, as he’s acting a lot more weird than usual. In a Washington, DC hotel room, Amanda Waller is shouting at Rick Flag via telephone. Amanda is the creator of the Suicide Squad and Rick Flag is the mission leader. 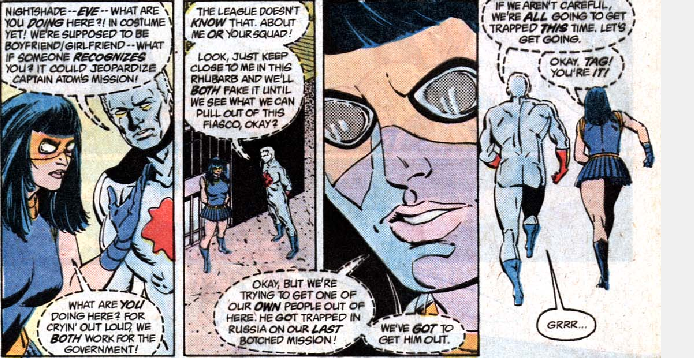 Rick wants to take the Squad to the USSR to rescue Nemesis, but Waller warns him that the only reason the capture was publicized was to lure them to Russia. She orders him to stay at Belle Reve and not to go after his teammate. After Rick hangs up with Waller, Nightshade asks him what the plan is. Despite the fact that they are fully aware that this is a trap, Rick and Nightshade agree to go ahead with a rescue effort. Back in New York, Batman is pumping Rocket Red #4 for information (his armor is mislabeled with a “13”). Dmitri says that just because he’s a Soviet citizen, that doesn’t mean he knows anything about Nemesis. He says if Batman’s friend is in prison there then he must have done something wrong. 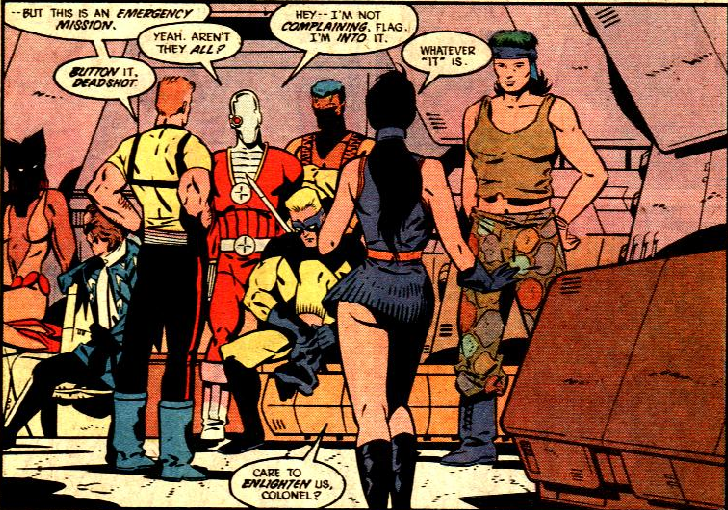 At Belle Reve, Flag has assembled his team (Vixen, Captain Boomerang, Deadshot, Bronze Tiger, Javelin, Nightshade, and Duchess). There is a gratuitous and unnecessary shot of Nightshade’s buttcheek. Flag takes the Squad to an airfield and briefs them on a plane bound for Russia. When Amanda Waller finds out what Rick has done, she goes immediately to meet with President Reagan in the White House. She suggests he sends the JLI to Russia to retrieve Nemesis. He agrees and Waller goes off to meet with Maxwell Lord. At the JLI New York embassy, Batman is trying to convince Martian Manhunter, Booster Gold, Oberon, Captain Atom, Black Canary, Mr. Miracle, Guy Gardner, Blue Beetle, and Rocket Red #4 to go after Nemesis (invade Russia – again). Oberon is upset that J’onn (Martian Manhunter, leader of the JLI) would even entertain the notion. His argument is interrupted by a call from Max, however, sending the JLI to Russia. On the JLI shuttle en route to Russia, it is revealed that a team of super villains has banded together to attack the very prison that is holding Nemesis. The JLI all agree it is an unusual coincidence. J’onn is on the video-phone with Boris Razumihin, the Russian bureau chief for the JLI. Martian Manhunter assures him the situation – and Guy Gardner – are under control. Guy has had problems in the Soviet Union in the past. When he hangs up with Martian Manhunter, Razumihin calls Gorbachev, reminded that Russia has super-heroes of their own. In New York, at Mt. Sinai Hospital, Amanda Waller pays a visit to Max Lord. Lord is recovering from the events of the previous issue. She warns him that the JLI had better maintain the secrecy of the Suicide Squad and she hints that if Max doesn’t play along he might end up dead. On the other side of the world, the Rocket Red Brigade is training when they receive orders and move out. Meanwhile, in Moscow, Red Star of the People’s Heroes meets with a Russian government official who warns him of the approaching heroes and villains. Red Star steals his car and drives off. When the JLI reaches the prison, they enter the warden’s office and Batman gets right to bullying the warden, demanding to see Nemesis. The warden says he’s under orders that no one is to see Nemesis. He also says he thought the Justice League was there to protect them from the villains. The warden receives a call and then agrees to take the JLI to Nemesis. Rocket Red #4 reveals that he radioed his government connections and convinced them to allow the JLI access. As they head to Nemesis’ cell (with Batman griping about J’onn’s leadership abilities), the Suicide is slipping into the prison via the loading docks. Upon reaching the cell, the JLI finds Nemesis unconscious on the floor. Batman suggests he was beaten and demands that the cell be opened. Rocket Red #4 says there’s no way he was beaten and he will not open the cell. J’onn warns Batman if he doesn’t cease his arrogant, juvenile behavior, he’ll be booted out of Russia and the League. 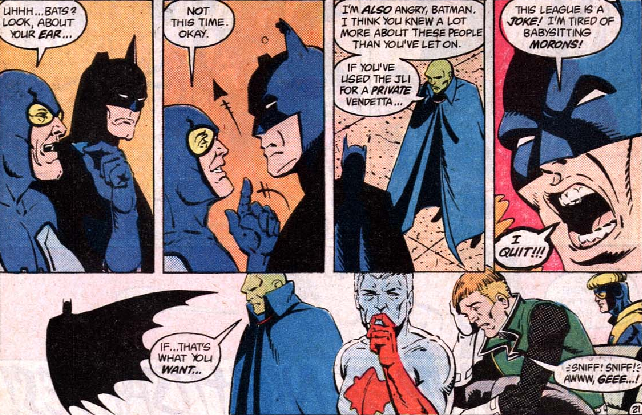 Batman agrees (after a dramatic pause) and asks Martian Manhunter what their next step should be. 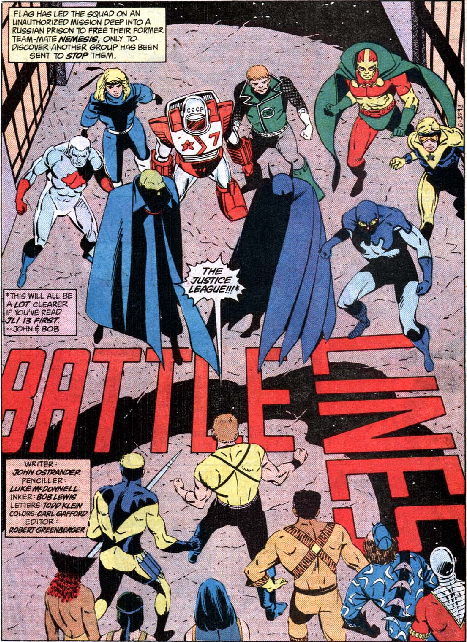 This is when the Suicide Squad appears, facing the JLI. At the time, I was reading both Justice League International and Suicide Squad, so I was super excited about this crossover. Not a lot happened in this issue, as it was merely setting up the conflict that would happen in the next issue of Suicide Squad. I give this an A- for story and a B for art (after all these years, I still go back and forth on what I think about Keith Giffen’s talent). 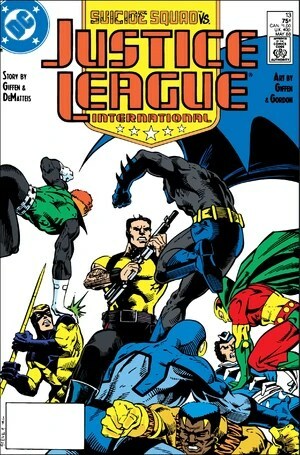 Part two of this crossover, cover dated the same month as Justice League International #13, was released to the public on February 2, 1988. It picks up where Justice League International #13 left off, with the Justice League face-to-face with the Suicide Squad in the corridors of a Russian prison. Ostrander really seemed to have a thing for Russia. He introduced Mikhail Arkadin (Pozhar) when he was writing The Fury of Firestorm, and Soviet-era hero-team Rocket Red Brigade were featured in the Ostrander-written Doom Patrol and Suicide Squad Special #1. With the Suicide Squad blundering beyond the iron curtain (not for the first time, either), it looks like John Ostrander was DC’s go-to guy for Russian super-hero stories. At the time these were published, I didn’t really care for the Russian stories so much. Looking back now, I really like them. They serve as a reminder of how it was growing up during the Cold War and being afraid of the Communists, building them up in my mind as something far more efficient and sinister than they really were. As much as I disliked the Russian angle, I was a huge John Ostrander fan in the mid-80s. I just about exploded with joy when he started writing Captain Atom, but that joy was short-lived (the series was cancelled just a few issues into Ostrander’s run). Although I still don’t like some of the stuff he’s written, I think it is safe to say I’m still a John Ostrander fan. Rick Flag warns his people that they will push through the Justice League if they have to. Rocket Red #4 (Dmitri Pushkin) warns everyone that he’s gotten word that the People’s Heroes, Red Star, and the Rocket Red Brigade are on their way. Duchess recognizes Mr. 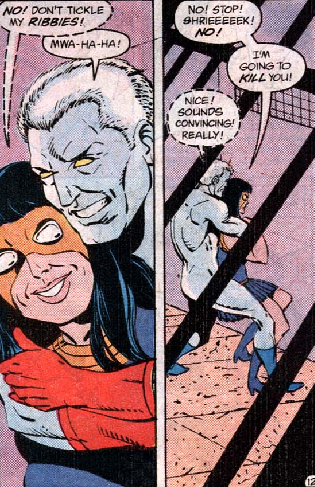 Miracle but doesn’t know from where she knows him (Duchess is actually Lashina – one of the Female Furies – with amnesia). When she approaches Miracle, Blue Beetle intercepts and flips her. She begins tearing the prison apart (tearing down the door to Nemesis’ cell) and using the pieces as weapons. Batman shames Deadshot, who turns his back on the dark knight. Martian Manhunter confronts Vixen – a former member of the Justice League. He is surprised to find her hanging out with super-villains. After some heated words, he hugs her. Captain Boomerang attempts to burst Guy Gardner’s protective energy bubble. 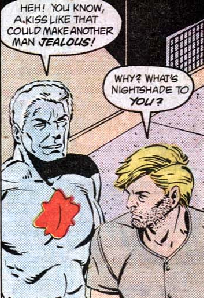 Captain Atom and Nightshade exchange some unfortunate dialogue. “We’re supposed to be boyfriend/girlfriend,” Cap says. What is he, a junior high student? “Stick close to me in this rhubarb.” Rhubarb? Why did he…? Who calls super hero fights “rhubarbs?” Is it supposed to make him sound hokey and old-fashioned? That makes sense, actually. He’s displaced from his own time. Like DC Comic’s own Captain America. Still, I’ve never heard “rhubarb” used this way. Flag confronts Batman, asking him if his team can just get Nemesis and get out, before things get out of hand. Batman refuses. He tells Flag that he warned Amanda Waller against using villains. Bats also says that if Nemesis truly is a member of the Suicide Squad, he’s not the Nemesis Bats once knew. When Batman begins to walk away, Flag grabs him to stop him. Bats punches him and they begin to brawl. 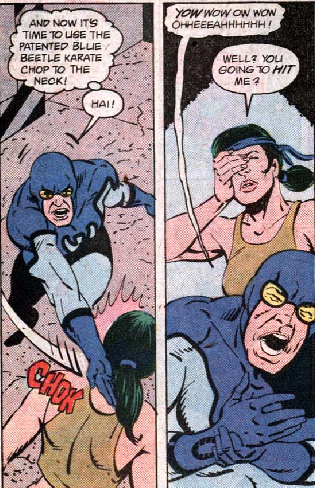 Meanwhile, Blue Beetle and Duchess are still facing off, but Beetle refuses to hit her. Mr. Miracle dodges Deadshot’s attack while Black Canary wonders why these villains and heroes have teamed up again (she faced the Suicide Squad once before). She pauses trading jabs with Bronze Tiger long enough to learn he won’t explain his team to her. Dmitri enters Nemesis’ cell to question him (he is incorrectly drawn with a number 7 on his armor again). Nemesis explains that he was attempting to help the author Zoya Trigorin escape Russia (defect, I guess). Javelin and Booster Gold face off against each other. This is particularly interesting because of the similarity in their costumes. Meanwhile, back in the United States, Amanda Waller is still visiting Max Lord’s hospital room. 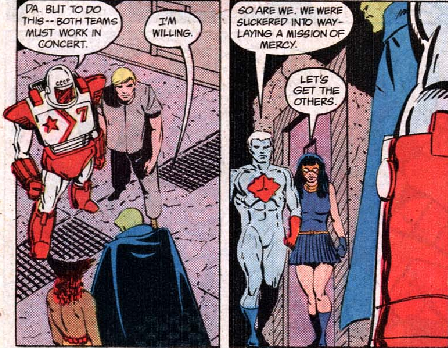 Waller is upset because the JLI is supposed to be in Russia only as backup for the Suicide Squad, the existence of which they are unaware of (most of them at least; clearly Captain Atom and Batman know of the Suicide Squad). But the JLI is butting heads with her team. She tries to convince Max to pull them out, but Max Lord reveals he knows a lot of Amanda Waller’s dirty secrets. She threatens to break his foot and Max calls for his nurse. Back in the USSR, the People’s Heroes, the Rocket Red Brigade, and Red Star are closing in on the JLI/Suicide Squad fast. Back at the prison, Blue Beetle is doing his level best to bring down Duchess while Captain Atom and Nightshade take part in a little foreplay. Seriously, get a room you two. In another secluded corner (does this prison have no guards? ), J’onn and Vixen are still making peace with each other. Dmitri approaches them with Nemesis and says the JLI and Suicide Squad must work together to save Nemesis. While Dmitri feels Nemesis’ jailing was warranted, he knows the Russian government will treat the prisoner unfairly and have him killed. The two teams stop fighting each other. Deadshot was apparently about to blow Mr. Miracle’s head off. He actually pulls the triggers when Bronze Tiger tells him to stand down. Luckily, Mr. Miracle seems to have the ability to dodge bullets. Now, that’s miraculous. Batman and Rick Flag are still working out their differences with their fists when the truce is called. Justice Leaguers and Suicide Squaders alike tell the men to stand down, but no one steps between Flag and Bats. Would you? Finally, after Batman loses a bat-ear, Bronze Tiger and Blue Beetle pull them apart. Flag is well beaten, and can barely walk. Nightshade opens one of her portal thingies and the Suicide Squad leaves. Before they leave, Nightshade plants a kiss on Nemesis, which bugs Cap. When the People’s Heroes, Red Star, and the Rocket Red Brigade show up at the prison, the Justice League informs them they’ll be taking Nemesis into custody. Martian Manhunter explains that the JLI’s charter and agreement with the Russian government gives them the right to take Nemesis with them. Back in the U.S., Max is threatening to sue Amanda (for her assault on him a few pages back). They are interrupted by a special news report explaining what has happened in Russia. Max’s only concern is that J’onn granted a (brief) interview with the press. Later, at the “JLI vehicle hangar,” Batman expresses his displeasure with the current incarnation of the Justice League and quits. No surprise there; Batman really doesn’t fit in with them anyway. At Belle Reve, Flag is taken off to the infirmary. Captain Boomerang is happy that for once two people he hates beat the hell out of each other instead of himself. This two-parter did a thing that happens in comics that I really dislike. After all that set-up, while we’re getting ready for an all-out throw-down between all these super powers, something happens at the last second and the fight is avoided. Aside from that, it was fairly well-written (even if Cap was mostly just in the background) and well-drawn. I am a fan of Keith Giffen, J.M. DeMatteis, and John Ostrander as writers, and Luke McDonnell did a fine job as well. I give these two issues a combined A-. Kaitlyn Van Dorn is an artist from Texas that works for Gateway Gaming. Her DeviantArt gallery has a lot of JLI inspired artwork, including this great Captain Atom/Power Girl/Power Girl’s cat portrait. Cap looks worried, but I’m pretty sure the cat’s claws aren’t X-ionized or anything. Scott Ryan-Hart is an artist from Columbus, Ohio. 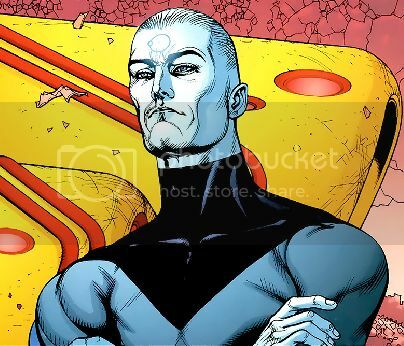 I found this on the #captain atom tag on tumblr.com. He also has a deviantART.com page. He’s posted lots of DC and Marvel characters, as well as other sci-fi/fantasy stuff.